We were driving through the rolling hills and plains of central Indiana and southwestern Ohio a couple of weeks ago. It was smack dab in the middle of a winter freeze, so the patchy snow and the gray-brown horizon of leafless trees presented a rather somber welcome. In some strange way we hoped for an unusual blizzard, or a sudden ice storm to sweep through, as they can be incredibly beautiful . . . but those moments are few and fleeting as the winter months drone on. We were fascinated by the farms dotting the perfectly level landscape. They’re functional collections of houses, grain silos and of course enormous barns, which can be found in every shape, size and condition imaginable. The unexpected glimpse of an occasional round barn always brings us to a stop at the side of the road. They are truly works of art. 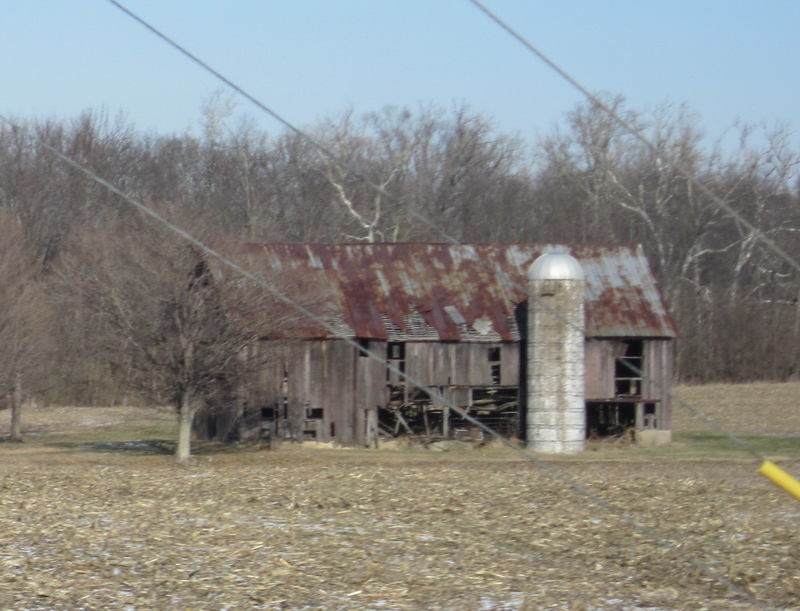 But the most fascinating aspect of the mid-western farm scene, is the appearance of a collapsing barn. The jarring images stirred our emotions, reflections and a good bit of en route conversation. We wondered why someone would let the enormous historical building right next to their tidy farm house just fall apart, board by board. Surely, there’s a practical answer to that question having to do with the maintenance compared to its utility, and the cost of demolition would be a bit pricey. Let’s face it, barns aren’t quite the center of farm life anymore. In fact, farm life itself has diminished. 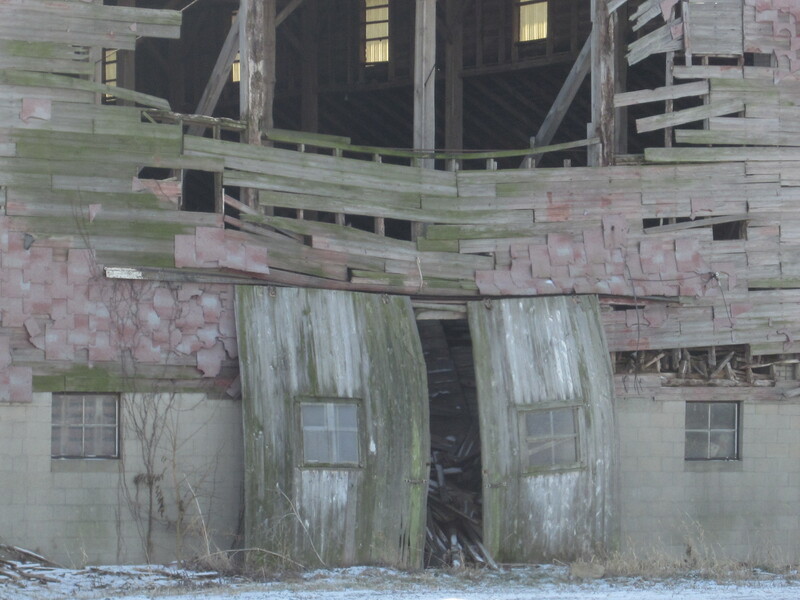 So, useless barns fall into disrepair, often becoming outdated liabilities as the years creep by. 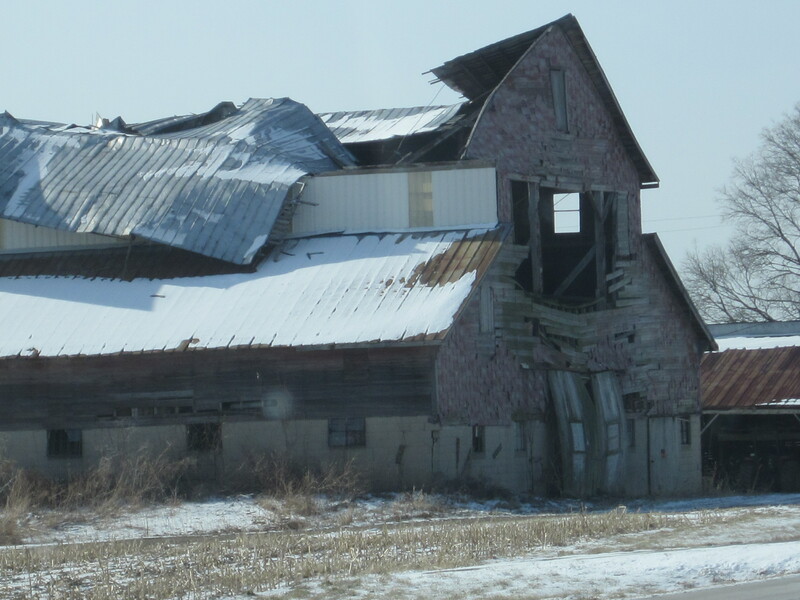 We felt a sense of sadness as we drove along, seeing far more barns falling down. There’s a sense of loss. Like when a bird soars by and you know that it’s one of the few left—in its waning days as an endangered species. As the last barn holdouts make their final groans and then with a mighty gasp, boards and beams fall to the dusty earth, the Mid-West will change, never to be the same. Our children’s children will probably drive those same roads one day, having their own conversations. Most of the old barns will be long gone. There won’t be the visual reminders of another time. Ah, barns! Seeing the lilting slant and tattered edges triggered conversation about the house we owned in Clinton Indiana in the late 1980s. The living room was paneled with wonderfully textured, weathered barn siding. What time-worn patina! The effect was warm and inviting, but we always had mixed emotions about the barn that was sacrificed to become paneling. 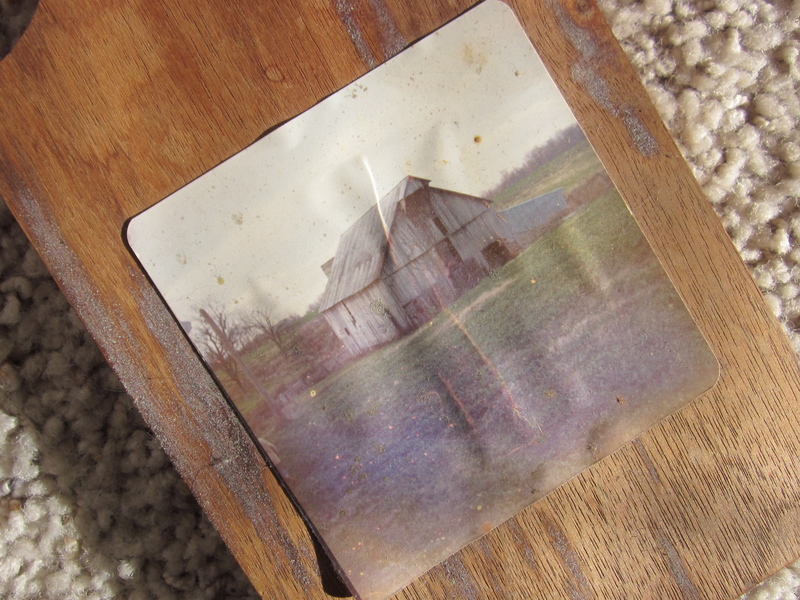 The previous owners gave us a small plaque with a picture of the barn that was dismantled for the renovation. It looked absolutely beautiful, sitting so serenely at the edge of the woods and pasture. Mom organized an impromtu lunch on the last day of our visit. Seems that my brother and his wife, as well as my sister were all available. We gathered at the Cracker Barrel restaurant, where we traded some pretty funny quips, stories and loads of laughter. It was a swirl of high spirited jousting. Soon we were reminiscing about our favorite family outing when we were kids—a trip to the country to visit Aunt Polly on the farm. Of course, she had a wonderful old barn full of hay, chickens and cows, where we could play and while away an entire day building forts, hiding from each other, or even testing our balance on the dangerously high beams at the tippy-top of the barn. We promised each other not to tell Mom! A few years later, we were again driving down that familiar dusty farm road toward Aunt Polly’s house. Giddy with excitement and anticipation, we three kids were bouncing off each other in the back seat of the old Pontiac. Boy, oh boy, another fun-filled day in the barn was literally just around the next curve. And then . . . We thought dad made a wrong turn when he pulled into the lane leading back to her place. I remember being very confused for a moment as I looked at the house which was clearly hers. But where was our great old barn? Aunt Polly told us that it had caught fire the previous winter. The old barn burned completely to the ground and was now just a scarred reminder of its glory days. We were devastated and wondered how we’d ever live through a day at the farm without our old friend, the barn. Visits to our roots and childhood haunts always bring an interesting mix of stories, love and laughter . . . along with a curious undertow of quiet and solemn reflection. Note: You might also be interested in some other stories about our Indianapolis and Indiana adventures.